You are viewing the archived Tissues rating page. Follow the link to view the current Tissues rating page. Compare facial tissues from Kleenex, Sorbent, Emporia, Quilton, Symphony, Coles, Woolworths & ALDI based on their softness, strength and quality, packaging design, value for money and overall customer satisfaction in 2017. Canstar Blue research finalised in October 2017, published in October 2017. Kleenex is the king of tissues – at least according to our customer ratings. 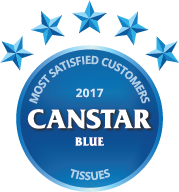 For the first time, Canstar Blue has reviewed facial tissues and found Kleenex to be rated five stars for softness, strength and quality, packaging design and overall customer satisfaction. At a time when more and more consumers are favouring home brand groceries, Canstar Blue thought it was about time to test Australia’s pulse on another supermarket staple where there is plenty of big brand and home brand choice – tissues. Canstar Blue research shows that 77% of Aussie consumers consider private label supermarket brands to be good quality, but does that sentiment extend to the aisle with all the toilet paper and tissues? Is it worth spending extra (more than double in some cases) on the named brands? Or do supermarket tissues tick all the boxes for you? We’ve surveyed more than 2,500 shoppers to seek their opinions on the facial tissues they most recently bought and used, with regards to softness, strength & quality, packaging design, value for money and overall satisfaction. Eight leading brands achieved the minimum sample to be included in the ratings, bringing a good mix of big names and private labels from the big three supermarkets, Coles, Woolworths and ALDI. And it’s the big name brands that will generally be happiest with the outcome, occupying four of the top five places in the table. Kleenex was the only brand to receive five stars for overall satisfaction. It also rated top marks for softness, strength & quality and packaging design. However, it achieved only three stars on value for money. Sorbent, Emporia, Quilton and ALDI Confidence all earned four stars overall. However, Emporia joined Kleenex in scoring five stars on packaging design, while the ALDI brand was the only one to record five stars on value for money. Symphony, Coles and Woolworths all rated three stars overall, but also all achieved four stars on value for money. Kleenex coming out on top is perhaps little surprise – it is generally considered king of the tissues in this country and most others around the world. However, at a time when Aussie consumers are increasingly making the switch to home brand products, it’s interesting to see there are some areas where we’re just not prepared to compromise on quality, even if we slightly begrudge the extra cost. ALDI Confidence is also worth a special mention as the only brand to score top marks on value. The supermarket chain has developed a strong habit of striking a good balance between product quality and price, with its tissues clearly no exception. With that in mind, a quick mention should also go to Woolworths given its home brand Little One’s currently tops our ratings for baby wipes. What do we look for from tissues? It seems clear from these findings that quality is the aim of the game, although consumers are also still very conscious of price. At the high end, you could easily spend $3 on a standard box of Kleenex tissues, while home brand tissues from Coles, Woolworths and ALDI all cost under $1. Swapping some big name brands for private labels is a simple and easy way to cut your overall grocery costs, but when it comes to tissues, you’ll have to ask yourself whether or not the extra quality is worth paying for. Canstar Blue commissioned Colmar Brunton to survey 3,000 Australian adults across a range of categories to measure and track customer satisfaction. The outcomes reported are the results from customers within the survey group who have purchased and used tissues in the last 6 months – in this case, 2,525 people.